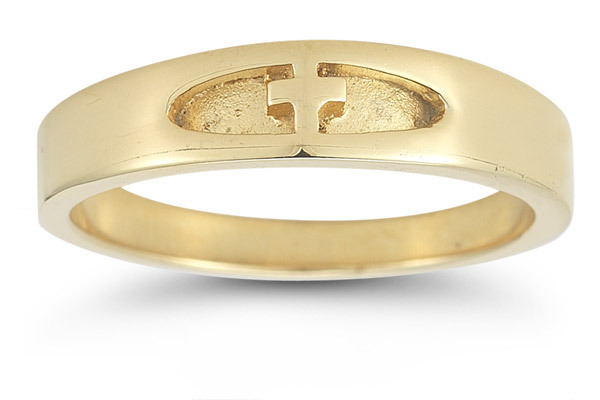 Yellow gold creates the perfect foundation for this Women's Christian Cross Ring from Apples of Gold. This beautiful ring specially crafted for a minimal design that's anything but boring. The smoothly polished gold band brings a lovely appeal to the ring. A focal point of the ring is the oval-shaped design that's cut into the band. This centerpiece has a slightly textured surface for a hint of added design, while a smoothly polished Christian cross adorns the center. We guarantee our Women's Christian Cross Ring in 14K Yellow Gold to be high quality, authentic jewelry, as described above.